Every craft has its own story to tell. In this blog post we are giving the glimpse of the different hand block printing techniques. Chippa community of Tarapur, Madhya Pradesh and Balotara, Rajasthan have developed their own technique by combining alizarin and resist printing techniques. In Tarapur this technique has been developed by Late Shri Purushottam Jhariya and his family. Presently EcoFab is working with his family to evolve different design pattern and shades of natural dyes. In this blog post we are discussing about direct or mordant printing. Rest of the printing techniques will be discussed in next blog posts. The widely used direct or mordant hand block printing technique is also known as Alizarin printing. Alizarin is a natural chemical which is extracted from the roots of Madder(Rubia cordifolia) & bark of Al root (Morinda Citrifolia) used to get natural Red color where alum has been printed and to fix the Black (Jaggery powder & iron rust) color. Today this natural alizarin is replaced by synthetic alizarin. It is also known as mordant printing because of use of mordants such as Harad (Myrobalan) powder and Fitkari (Alum) in the process. In Indian traditional hand block printing industry natural Alizarin was extracted from roots of Al tree (Morinda Citrifolia) commonly known as "Al Tree". Alizarin was the first natural pigment which was made synthetically in the lab in the year 1868. In India it got popularized some 50 years ago since then not a single hand block printing cluster using natural Al roots to get the red color. Even present generation of hand block printers not only forgot the use of Al roots but also the process. 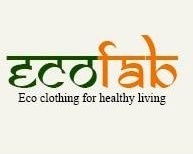 With the arduous efforts and research EcoFab team came to know that today it is used by tribes of Kotpad region of Orissa to dye the motifs of their handloom Sarees and fabrics. Easy to use and cost effectiveness of synthetic alizarin made it popular among the hand block printers community in India so it has replaced the use of Al roots to get red color. In this direct printing or alizarin printing only two colors red and natural black can be printed. 3. Bherogarh print (Ujjain, Madhyapradesh): Now a hub of batik printing. In many other places of Rajasthan and Gujarat Alizarin printing is also practiced apart from Dabu and Ajrakh printing.